Many people don't realize that the camo pattern used by hunters and the military to blend in with an environment can also be used in almost exactly the opposite way: to make a person's best features stand out! 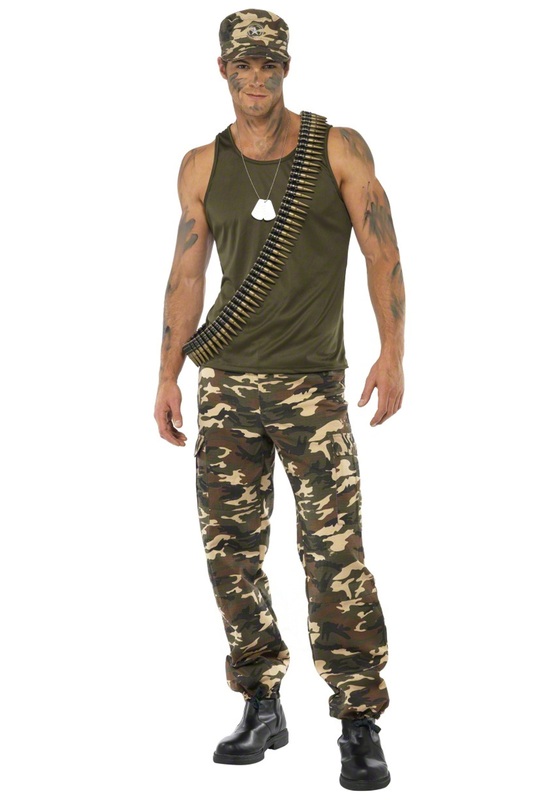 That's why this Male Khaki Camo Costume includes camo-print pants and a sleeveless earth-tone tank top. When the rest of your body fades into the background, your muscular neck and biceps will seem extra bulgy by comparison! That's right. We're out here on the front lines of costume design, coming up with bold new strategies for maximizing the effectiveness of even a simple two-piece costume like this one. It's not at all like being a real soldier, which requires toughness, bravery, dedication, and heavy-duty safety equipment. But kind of like soldiers spend a lot of time trying to keep people out of harm's way, we spend a lot of time trying to keep people in great costumes. Kind of. Okay, not really. Our job is way simpler, far less dangerous, and involves infinitely more furry purple monsters. So you should know that this costume doesn't carry any kind of rank or privilege. Remember what we said about safety equipment? 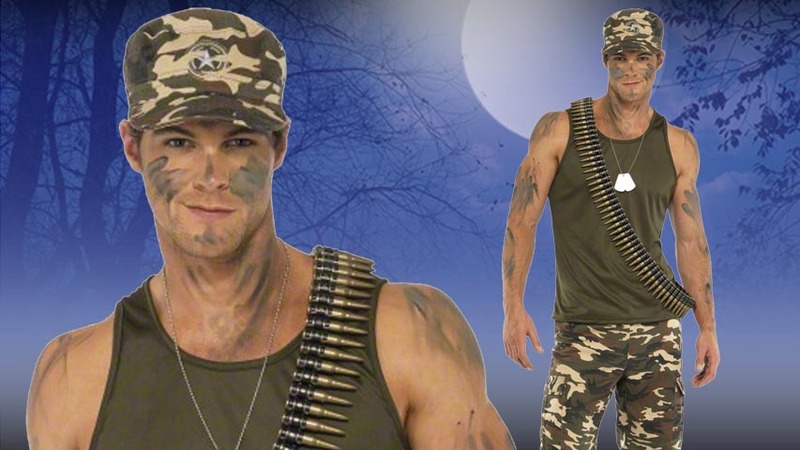 This costume doesn't count: it's purely for looks. And it looks good! Just don't try to be a hero unless you've actually made it through basic training. Maybe hit the gym, for now. Stick to military-style presses. You're gonna want your guns to look their best when it's time for them to shine!